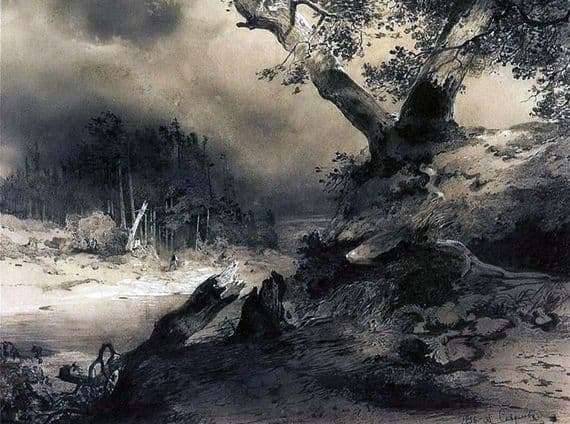 The eminent artist Alexei Savrasov always liked to depict pictures of nature during a thunderstorm. This interest in romantic landscapes was instilled in him by the painting teacher Rabus. The effects of lighting, the color scheme in the image of a thunderstorm Savrasov conveyed very skillfully. The artist wrote the picture titled “Thunderstorm” in 1856. This painting became the brightest example of the art of the period of realism. The genre of Savrasov’s painting is the landscape, in writing of which the artist used the technique of visual art – oil. On the left you can see a huge split tree, which moves under the influence of a gusting wind. There is a strong thunderstorm in the air. On the left, there are forest trees, which are falling from a wind gust. The color of the canvas is the saturation of a dark color. Everything looks so gray that you can’t even see the thunderclouds. Such a picture is even unusual, despite this seemingly simple name. In it, the painter proved himself as a subtle artist and a true master of the brush, depicting something unusual. The canvas “Thunderstorm”, painted in dark tones, reminds viewers that something very harsh and terrible is happening. The artist delicately conveyed the tousled trees, the flatulence of diffuse clouds that fill most of the canvas. As you can see, Savrasov wanted to show the viewer the image of nature during a thunderstorm. He succeeded, because it seems that the storm seized some immense spaces. On the one hand, such a formidable element scares a person, but hope glimmers that everything will soon pass away and darkness will disappear. This picture cannot but please the viewer, although it is rather gloomy, because the artist very skillfully conveyed, the element is so strong.